Constance Baker Motley was born on September 14, 1921 in New Haven, Connecticut. She was the ninth child in a family of 12 children. Her parents were emigrants from the island of Nevis in the West Indies. Motley grew up attending New Haven’s integrated public schools and soon became an avid reader. She was inspired by books concerning civil rights heroes and by the age of 15 she had decided to become a lawyer. Due to her family’s economic situation she could not afford to attend college immediately after graduating high school. Instead she took up a job as a maid for a short time before finding a job with the National Youth Administration. Giving a speech at the local community center one night, a wealthy white contractor, Clarence Blakeslee, was so impressed that he offered to pay for her college. Motley began her college career at Fisk University, Nashville, Tennessee in 1941. In 1943 she transferred to New York University where she received her bachelor’s degree in economics. In 1944 she became the first black woman to be accepted into Columbia Law School. It was here where she met Thurgood Marshall, chief counsel for the NAACP Legal Defense Fund. Motley worked for the Legal Defense Fund while she obtaining her degree, which she received in 1946. In that same year she married a real estate broker, Joel Wilson Motley, Jr. Their marriage would eventually produce a son, Joel Wilson Motley III. Motley’s career with the NAACP would bring her many high profile cases often involving school desegregation. She played a major role in the legal preparation for the 1954 Brown vs. Board of Education case and was the first black woman to argue a case before the United States Supreme Court. She was also the lead council in the case to allow James Meredith to gain admission to the University of Mississippi in 1962. 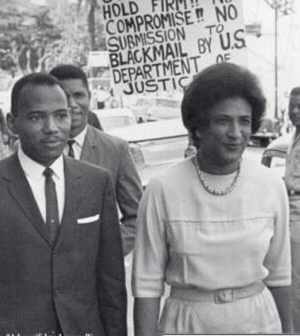 Besides fighting for the rights of blacks to get into segregated schools, Motley also defended protestors arrested during the Freedom Rides sit-ins of the early 1960’s. She won nine out of ten cases argued before the Supreme Court between 1961 and 1963. In 1964 Judge Motley entered politics. She was the first woman to be elected into the New York State Senate in 1964 and in 1965 became the first woman to hold the position of Manhattan Borough President. President Lyndon B. Johnson appointed Motley to the United States District Court in 1966, making her the first African American woman to hold a Federal Judgeship. Judge Constance Baker Motley died of congestive heart failure on September 28, 2005 at the age of 84. Over the course of her long career in law and politics she has received over 70 awards and 8 honorary degrees from universities. Dorothy C. Salem, ed., African American Women: A Biographical Dictionary (New York & London: Garland Publishing, 1993); Darlene Clark Hine, ed., Black Women in America: An Historical Encyclopedia (New York: Carlson Publishing Inc., 1993); National Women’s History Project: http://www.nwhp.org/.